Do you want to start a blog for your small business or just a fun blog for your daily journals? There are many reasons to start a blog, but whatever your reason is, follow these guidelines to start blogging today. Your first task is to manifest your fantastic idea for a blog. Then, the rest is laid out for you below. I use a no-nonsense approach with no extra expense – just the facts that you need to get your new blog going. I created my first blog in 2007 and I spent years trying to figure it all out. That’s because there is so much information out there that it quickly becomes overwhelming. As a result, I followed several different blogging influencers and quite often it cost more money than I had to get the “secret sauce” for their success. Never-the-less, with that accumulated knowledge and experience, I move forward daily devising and discovering new ways to create my own “sauce” that I have no intention of keeping “secret”. What is your purpose for starting a blog? It might be for an outlet to journal your daily thoughts and dreams. Or, you can use your blog to share knowledge with others on a topic that is near and dear to your heart. Additionally, you can start a blog to promote your business or to create a business. For instance, you can build a list of followers and monetize your entire website and individual posts for multiple income streams. In any case, nothing has to be cast in stone to start your blog. Eventually, you’ll have a well-developed blog that becomes the pinnacle of your business and you’ll wonder why you waited so long to get started. At this point, you might think that it all sounds good but you have no idea where to begin – well, neither did I. That’s why instead of spending years spinning around in circles as I did, I suggest that you start with some solid basics and build from there and that’s what I’m here to show you. However, I promise you can do this literally with no experience or technical skills. So, grab a cup of coffee and let’s get started with your new blog. 1. Open an account with WordPress.org. 6. Customize the look and feel of your blog. I’ve worked with a few different platforms starting with HTML websites I created with Adobe DreamWeaver. Then, I fell in love with the Ning niche social media platform for a few years. Finally, I progressed to WordPress Content Management Systems or WordPress CMS. WordPress is the easiest, fastest way to build a website. It is loaded with options that a beginner can use while they impress even the most seasoned webmasters. In short, the versatility built in WordPress is what I need and there’s no need to look further. My first introduction to WordPress was through WordPress.com. It does not require a separate hosting package. However, you also don’t own the blog nor its contents. You can compare it to a social network in that way. Still, it’s a great way to get your feet wet in the blogging world. On the other hand, with the WordPress.org resources, there is a little more expense involved up front. But if you want a professional, personally owned website, I recommend WordPress.org for your website. Over the years I found myself pulling my hair out with the poor service I received from hosting vendors. That’s because most hosting services cheerfully sell you packages for hosting a blog but that’s when the service ends. Then, to continue to use these services successfully you have to be an advanced coder and webmaster! What’s even more frustrating is that several times, I went online to find my site down because hosting servers went down. Then there were the phone calls for help at which time they then informed me that they don’t support questions about WordPress. Then, I found WPEngine. In two years since I began using their services, there has been no downtime for this website what-so-ever. One of the most important fail-safes is their back up system which is as easy as pressing a button while you set and forget your backups. That’s comforting! The people at WPEngine host WordPress exclusively so there’s premium support at every level of service. Moreover, the support is stress-free which means, very little wait time at the help desk. It also means the help is friendly, courteous, responsive, and best of all, they know their stuff when it comes to WordPress! It blows me away that WP Engine offers free Genesis Framework and StudioPress Themes with my hosting package. I wanted to use these themes for sooooo long but I couldn’t justify the expense and now … well, I’m thrilled because everyone knows that StudioPress themes are the best ever. Here are several themes I selected to get you started. But don’t stop with these, check out all the themes on WP Engine to ensure that you get the right theme for you. Remember, these are premium themes so no matter what theme you select, you get all the features you need for a professional, polished website with minimal effort. But, before you begin, remember that these themes are free if you have a WP Engine hosting account. I caution you because as you click through the images below you will be taken to pages where there are prices listed for these themes. The prices are high so I don’t want you to be taken back because the prices are included in your WP Engine hosting account and that is the one of the most attractive offers by a web hosting company that I have come across in the 20 years I’ve been building websites. Grammarly is an online grammar checking, spell checking, and plagiarism detection platform developed by Grammarly, Inc. The software was first released in late 2009. Grammarly’s proofreading resources check against more than 250 grammar rules. Grammarly is a no-hassle way to keep your blog posts error free and professional. If you can write at a 10th-grade reading comprehension level, you can blog. But, if you want help with spelling, grammar, synonyms, and more, Grammarly is the best tool for you to use. The team at SocialPilot is on top of their stuff! They are so personable that I never feel like a number and they have a short turn-around time to respond to questions. What’s really nice is the bulk posting which saves me a lot of time. 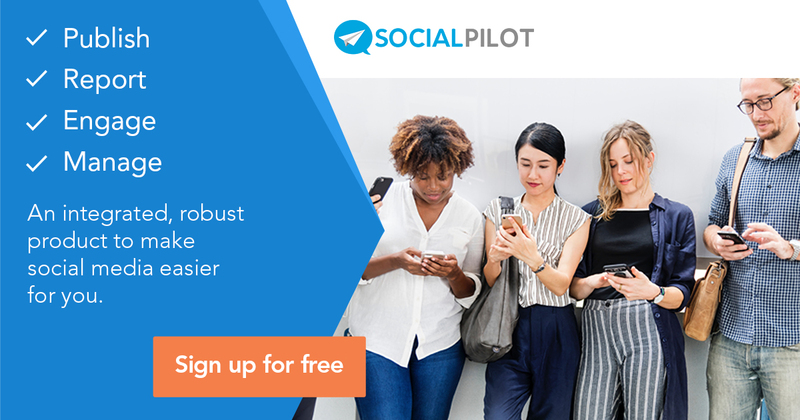 All this makes SocialPilot my go-to software for social management. I encourage you to try it today to post, engage, and manage the social media marketing tasks of promoting your blog to your readers. My first and foremost go-to vendor for professional images of every type, size, shape, color, and topic is Creative Market. I sometimes spend hours going through Creative Market graphics and use my imagination to wonder how they would look in different online settings. It’s almost like escaping to a dream world. Well, for a graphic stylist such as myself, it is a dream world! The point is, I assure you that you will find whatever you need for your online marketing or home creative needs from this source. Moreover, they are much more affordably priced than many other venues. Are you ready for summer designs? Look no further! Do you love elegantly designed fonts? Here they are! This page is still under construction, so, return soon for more great ideas and inspirations for starting your own blog.